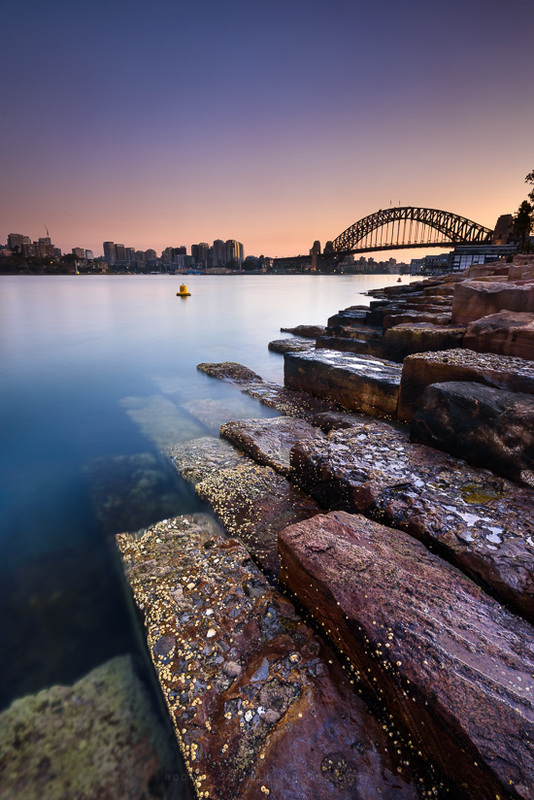 Having never shot at the new Barangaroo precinct here right at the north-western tip of Sydney’s central business district I figured it was time to give it a try. So (last year! :)) I invited Gerry to join me for a quick morning session down here to see what it might bring. Note: These images (especially the wider shots) look much better when larger. Click any of the images below to see larger versions in an inline overlay slideshow gallery viewer. Anyway this location isn’t too bad a spot – I’d imagine it would work in some parts for sunrise and in others for sunset so it’s got potential. I think it needs good clouds and colour in the sky to work well. This is something which was severely lacking the morning Gerry and I were there :(. 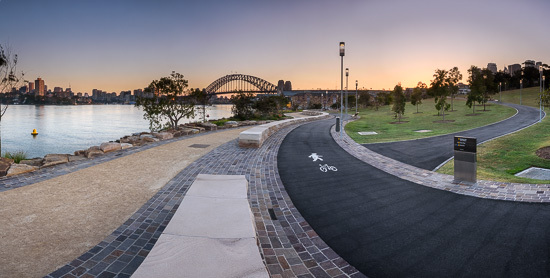 One of the big features of the new Barangaroo Reserve is the more than 10,000 sandstone blocks were used to create the extraordinary headland park on the city’s doorstep. Ninety three per cent of the blocks came from Barangaroo itself. They were painstakingly extracted from beneath what is now the Cutaway, the Reserve’s massive cultural space. As the shot above shows this has definitely got potential. I’m now thinking of some aerial drone possibilities with this lovely rock and patterns from above :). To be honest however I don’t think either of us was particularly enthused this morning – the sky was just bleh… Still we forced ourselves to take a few shots and Gerry even crafted a nice simplified LE from a shot of one of the navigation poles out in the water. Even a stitched panorama wasn’t enough (these my last frames of the day). 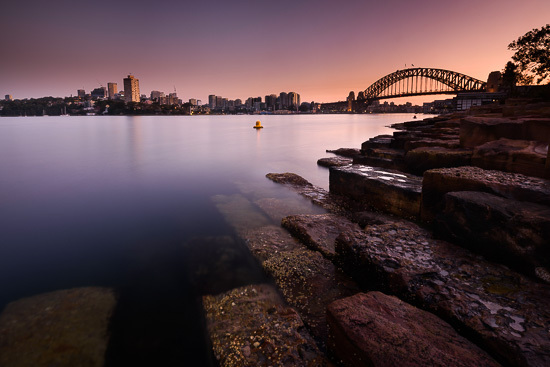 With the sun just about to rise on the other side of the city this panorama is the result of stitching together four vertical bracketed frames. Each of the frames the result of blending five (5) bracketed exposures from -2EV to +2EV.